Anne-Marie Mineur (GUE/NGL) is a member of the Committee on International Trade and shadow rapporteur on CETA. Bart Staes (Greens/EFA) is a rapporteur on the CETA opinion. Pavel Poc (S&D group) and shadow rapporteur of the opinion on TTIP. All three are members or substitutes on the Committee on Environment, Public Health and Food Safety. As usual, negotiations on the EU’s 2017 budget between the three EU institutions were tough. But an agreement was reached late Wednesday night, which will be voted upon soon. However, one huge saving post in the EU budget has been completely overlooked! We can easily scrap, let’s say 10% of the budget of the European Parliament (of two committees), since a big chunk of its leadership has apparently decided recently that the control function of the Parliament should not be taken that seriously. Surprised? 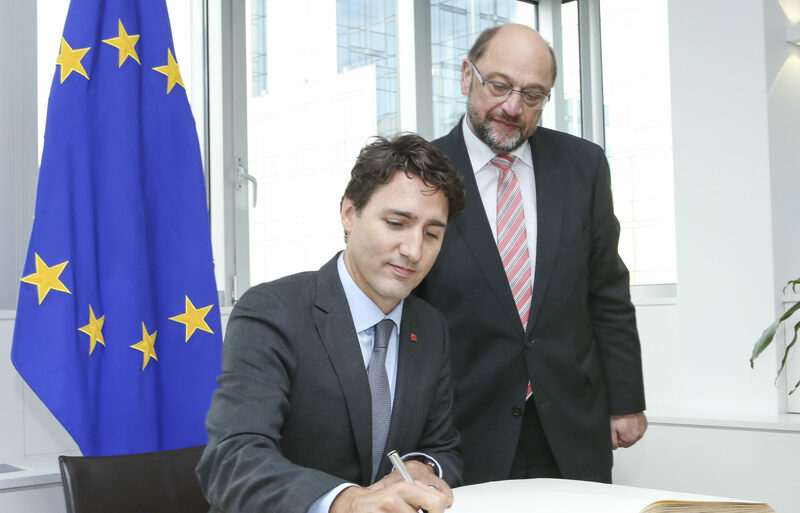 Case in point is CETA, the controversial trade deal between the EU and Canada. Let’s look at the facts. Since the dawn of the EU, MEPs have fought hard to democratise the EU and have demanded an increased role of the Parliament in the legislative process. In 2009, European democracy celebrated a small but important victory when the Lisbon Treaty granted the Parliament new rights to scrutinise EU trade policy. Now, some of our senior colleagues in the Parliament are playing rather sad games to put all this progress in jeopardy. With their stubborn intention to fast-track CETA with historical speed, they are likely to set a terrible precedent that damages and undermines the Parliament’s role as the only directly elected, democratic watchdog of the EU. This fast-tracking means there is simply not enough time for MEPs to consider the deal. CETA was officially finalised and signed just three weeks ago, with extra, last minute negotiated text, yet the Parliament will already vote on whether to ratify it on 14 December. This means that MEPs face an impossible task: they have less than two months to scrutinise 1,600 pages of a highly technical, complicated and far-reaching international agreement – which took more than seven years to negotiate – before voting on it with a simple Yes or No vote. The fast-tracking of such an important vote is both unprecedented and undemocratic. It also means that there won’t be enough time for MEPs to scrutinise this agreement within the remits of their specific committees and to receive guidance from these relevant committees on how this agreement will impact specifically environmental, agricultural, public health or labour rights issues. Not only will this result in an information gap, but it runs contrary to the customary procedure in the Parliament. It is easy to write a blank cheque of approval, as the Committee on Foreign Affairs did. As the Environment, Public Health and Food Safety Committee and the Employment and Social Affairs Committee were in the process of drafting more critical opinions, they suddenly found themselves banned from issuing them. The Conference of Presidents did not allow them to submit formal opinions by decision on 17 November. Only after strong protests were they finally allowed to issue their opinions, albeit contorted into a timeframe that won’t allow significant deliberation in committee. This undemocratic and unprecedented interference in the work of committees sets a dangerous precedent for the functioning of the European Parliament and subverts the democratic decision making process it stands for. This kind of behaviour will reinforce arguments by ‘Trumpist’ political forces in Europe. Finally, the presidency of the Parliament moved to stifle debate about the legality of CETA. After repeated concerns by law professors and European and German judges associations that CETA might not be compatible with the European treaties, 89 MEPs launched a resolution that, if adopted, would bind the Parliament to request a legal check from the European Court of Justice on the compatibility of the agreement with EU law. However, the presidency refused a debate on the matter in plenary, and thus aimed to prevent a discussion of a motion that aims at safeguarding the rule of law in the EU. Again, following protests, the matter was put to a vote. By a narrow margin of 14 votes, we lost to colleagues who would seek to suppress any further debate. We are flabbergasted that our institution can hold debates on issues such as the switch between summer and winter time, yet fails to serve as the focal forum for a meaningful debate on a highly controversial and important issue like this far-reaching, neo-liberal free trade deal. Fast-tracking CETA threatens to further undermine the legitimacy of the European institutions and feeds directly into the hands of growing populist movements. CETA has been widely criticised by millions of citizens, by consumer organisations, trade unions, farmers, regions, cities and even parliaments. But regardless of whether or not we support this agreement, it is our role and duty to hear and consider all arguments, in the forum where this debate needs to happen – in the European Parliament itself.